And so, after the disastrous try to set up an old Chromecast, it happens that I bought the new video Chromecast and the new Chromecast Audio :). First let's take a look at the Chromecast Audio which was the reason I'm even trying to engage in the Google Cast universe again. As you can see, the configuration is pretty much straight forward even with my Fritz.Box router. I edited the time waiting to continue out of the video. It can take a bit longer than shown. The interesting part now is, opposed to the presentation, you can of course not only connect a speaker to the device. It works with headphones, but for a speaker you'll need an amplifier in between. I bought a bunch of Lepai 808 amplifiers which are perfect for the job. To save even more space, I'll do something that doesn't comply with my usual principles on audio. I will use 1 speaker. Yup, right, mono. It's enough for the scenario, which I will come later to. The problem though is, one can't just simply connect only one speaker ;). The Chromecast Audio of course delivers a stereo signal, which means there are different sounds on the 2 channels. With some music you won't notice it, with some it's like you listening to a complete different song. Or not even try to listen to discussions or other speech tracks, because they often use one channel for a single person. So you won't hear one person at all. Do not try to crosswire 2 speaker outputs to 1 speaker. It will likely kill your amplifier. 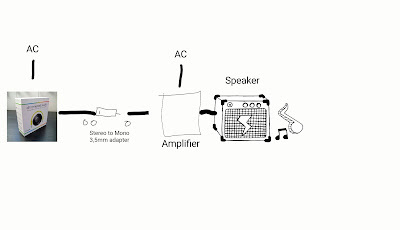 I chose to use an stereo to mono 3,5mm adapter between the Chromecast and the amplifier input. That way, you have both channel on 1 channel together. You connect only one speaker on the correct speaker output and it works. The Lepai 808 can handle a one speaker output just fine. 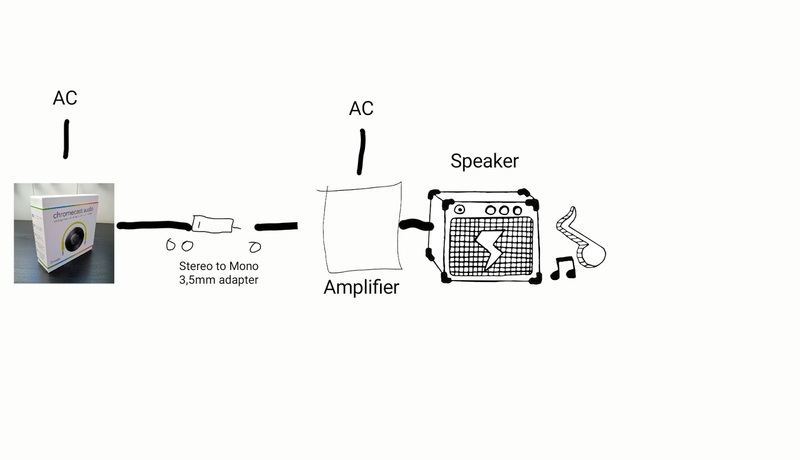 Later I'll build my own, very compact, stereo speaker with the Chromecast Audio integrated. That will be something for another post. So the audio only solution stays kind of portable. It can be quickly put from one room to another with the tiny amplifier and the compact speaker. 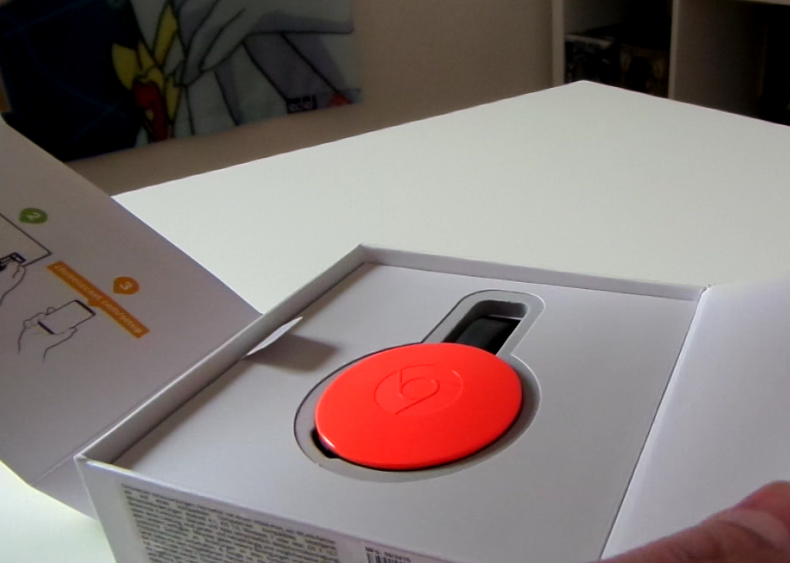 For the living room, I bought the new Chromecast for video. That's totally okay since I have a Samsung H-series TV. You can completely shut off your LCD (not only make it dark), but the speakers remain on. That means you save a lot of energy, and your screen panel will be spared. The configuration of this was really a hassle. The problem seems to be that, despite that now the new Chromecast supports 5Ghz WiFi, it needs to be in that same frequency. I could not manage the Chromecast to connect to a Fritz.Box with the phone in the 2.4Ghz range, and the Chromecast in the 5Ghz range. Since it seems random which device connects to what range, even my 30+ tries didn't work out. I ended up making the 2.4Ghz and the 5Ghz two separate WiFi-networks with different SSIDs. Also, it did not work with a hidden SSID in 5Ghz, but fine with hidden SSID in 2.4Ghz networks. I assume that's a bug. So now I could force the 2 devices in the same range and I could setup the Chromecast. Now it works like intended. There is an interesting difference between the 2 Chromecasts. You can not stream YouTube audio to the Chromecast Audio directly. Yup, big bummer. If you have a big collection of music on YouTube forget about to simply listen to it with your Chromecast Audio. I hope this will change in the future. For now there is only one, very inconsistent way to listen to YouTube audio. You need to cast the screen/audio completely to the device. But that means your phone is streaming directly, which drains your battery, you network is under more load, and the sound quality is a bit lower. Chromecast usually streams directly from the source, not your phone. This is one big advantage over bluetooth which will be completely lost. So it works. With some hiccups. If you know that I have a pretty simple WLAN, it will not end up well for some non-techy people. The audio quality on both devices is good. If the devices run, it is an easy thing to start listening to music or watching video where you want. Great that you don't need another remote control flying around, because we all have our phones or tablets in reach, right? The price... well just order a few. It's so cheap you can have one in every room. Google continues developing and will soon offer multiple room audio features. You always wanted that but couldn't justify spending $900+ for a 3 room setup? Now it's your time. Together with a normal active speaker you can go at $70 for a room for a total of $210 bucks. Of course, with a decent speaker you'll pay more. But what you get for $450 is probably better than the competition in terms of sound quality.